In the fall of 1856 three brothers-in-law, O.C. Howe, B.F. Parmenter and R.U. Wheelock, visited the lakes region. They were so impressed with the area that they determined to return, acquire land and lay out a town. Other families had built cabins along the shores of the several lakes that summer, but this settlement met with tragedy on March 13, 1857 during a clash between the early settlers and a renegade band of Sioux led by Chief Inkpaduta. On that fateful day all of these early pioneers were killed except for four women who were taken captive. When the news reached Ft Dodge, Howe Parmenter and Wheelock were among the 100-man relief expedition which returned to the lakes. In June of 1857 the three men along with George E. Spencer became the original proprietors of “Spirit Lake City,” as it was then called. Just to the north in the Minnesota Territory tensions still continued between the Dakota Sioux and the early pioneers. Local citizen concern led to the building of a fort in the Iowa lakes area in the summer of 1857 on the ground where St. Mary’s Catholic Church now stands. An historical marker placed at the corner of Hill Avenue and 11th Street by the “Ladies of the Lake” Chapter of the DAR commemorates this old fort. That same summer several houses were built nearby. In 1879 the town of Spirit Lake was incorporated and was designated as the county seat of Dickinson County. The first census of the town in 1880 recorded a population of 277. The completion of two railroads into the lakes area was a major factor in increasing the population to 751 by 1885. The Chicago, Milwaukee and St. Paul Depot became the home of the Dickinson County Museum after 1973. That building along with a later addition still serves as the museum. The first court house was built in 1860, but was destroyed by fire in 1872. A court house constructed in 1890 was razed in 2006 and was replaced by a state-of-the-art facility in 2007. An historic replica of the 1890 court house tower and a Veterans Commemorative War Memorial are part of the new project. As people were drawn to the shores of these beautiful lakes, accommodations were needed. One of the first hotels, the Lake View House, was built in 1859 and located at what is now Hill Avenue and Lake Street. After it was purchased by Orlando Crandall, it was renamed the Crandall House. The Antlers Hotel was built on the same site in 1902. The Antlers has now been renovated and restored for use as apartments and retail stores. Another corner building that retains some of its 1894 appearance was first the A.M. Johnson Dry Goods Store on the corner of what are now Highways 71 & 9 and Hill Avenue. It has housed a variety of businesses and is currently Edward Jones Investments. To the north on Hill Avenue and Lake Street is the beautifully restored First Bank and Trust Building, which was previously the First National Bank. Those who sought cultural activities near the turn of the century could take advantage of the summer Chautauqua gatherings located on grounds at the north end of Hill Avenue. In 1892 the Spirit Lake Park Association built an auditorium on the shores of East Okoboji for the crowds who thronged to hear speakers and musical groups. Downtown in the early 1900’s the Opera House, located in the first brick block of the town (the Stevens Block), was the center for all operettas, town and school plays, Lyceum programs and even basketball games. In the late 1920’s a fire destroyed this fine old gathering place. Sportsmen were eager to try their skills in the lakes and lands where fish and game were plentiful. The isthmus between Big Spirit and East Okoboji Lakes has been the setting for two previous fish hatcheries (1880 and 1915) and now is the location of the Spirit Lake Fish Hatchery, which attracts thousands of visitors annually. One of the most famous sportsmen to live in Spirit Lake was Fred “Dood” Gilbert, known as the “Wizard of Spirit Lake.” Gilbert, a renowned trap shooter, was enshrined in the Amateur Trapshooting Association Hall of Fame in 1969. A park toward the north end of the city bears his name. Another Spirit Lake native loved to fish as much as the rest of his family and made a name for himself not by competing in the sport, but by founding the Berkley Fly Company. In 1937 Berkley Bedell began his business in his home while still in high school. The expanded Berkley and Company became a national leader in the fishing tackle business. Now named Pure Fishing, the industry headquarters is located on Highways 71 and 9. Bedell also served as a U.S. Congressman from the Sixth District from 1975 through 1986. The early pioneers lived through crop devastations by blackbirds and grasshoppers; times of plenty and times of drought. The water levels, often a point of discussion, rose to record highs after heavy and persistent rains in the spring and summer of 1993. Residents of Spirit Lake and surrounding communities constructed various sandbag barriers along lakefront properties and roadways. The water receded only after emergency enlargements of the Lower Gar and Orleans outlets. Through the years, business and professional men and women of the city have been supported by first the Spirit Lake Commercial Club, now the Spirit Lake Chamber of Commerce, a division of the Iowa Great Lakes Area Chamber of Commerce. 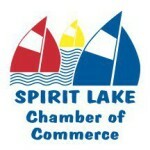 The Chamber celebrates the community with the annual event, Spirit Lake Days, now held in July. The downtown, surrounding residential areas and parks hold a bit of history at every turn. The Hill Avenue Beautification Project (1995 – 2004) sought to remind us of an earlier era. The street lights, pavers, benches and plantings do just that. The original Carnegie Library east across from the court house no longer houses books, but has been put to very good use through the years. It was dedicated in 1912 and is on the National Register of Historic Places. As you walk north through the downtown, notice the dates and inscriptions on some of the other buildings. Just to the east of the downtown area on Lake Street discover a residence that was the mansion of a former State Senator, then a hospital and then a bed and breakfast. The citizens of Spirit Lake, now a city of nearly 5,000, have been careful to remember and preserve some of the past while moving forward to expand their city in the important role of a business, cultural and recreational center. Both the Dickinson County Museum at 1708 Keokuk and the Spirit Lake Public Library at 702 16th Street hold many more stories from the past – a past of which Spirit Lake is very proud.